Far before Nikon introduced its rangefinder camera in 1948 Nikon produced photographic lenses for fellow camera manufacturers. 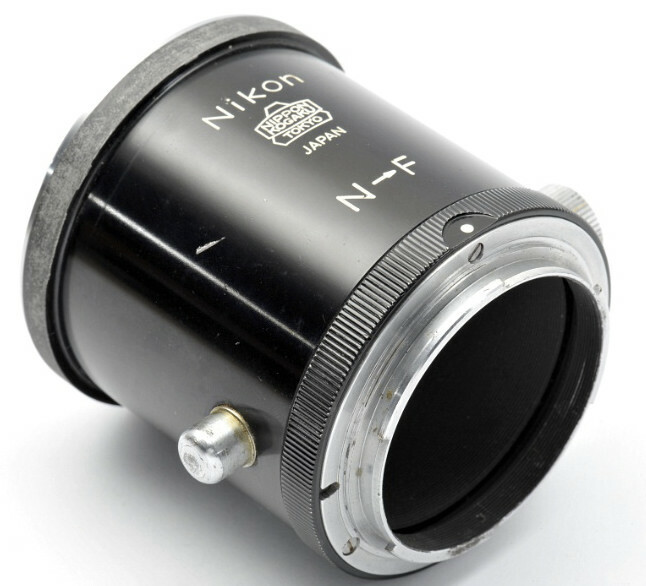 Since the early 1930´s Nikon produced a limited range of photographic lenses; limited in comparison with the enormous range of focal lengths of modern Nikon lenses. Since 1932 Nikon has given its lenses - for nearly all photographic lenses it produced and produces - the name ´Nikkor´. Some lenses have a prefix indicating the special purpose or performance. The most important customer for photographic lenses in Nikon´s early years was Seiki Kogaku (nowadays known as Canon Camera Co). After Nikon intended to produce its own camera in 1946/1947 Canon started to produce its own lenses. The lenses Nikon made for Canon and some others have a thread mount, based on the 39mm thread mount Leitz is using for its pre-W.W.II Leica cameras. After 1948 Nikon was still producing lenses with Leica thread and - in addition to that - a special mount for Exacta cameras and for the Contax rangefinder cameras. Other camera manufacturers, like Mamiya and Leica were using Nikkor lenses. Many lenses were also converted to a thread and/or bayonet mount (C- and D-mount) for movie cameras (Aaton, Pathé, Arriflex and others). It seems that Nikon has considered to use the Leica thread mount for its rangefinder cameras as well, given the few test models of the Nikon I, also known as Nikon L. Only 4 cameras with a Leica thread mount are known. See for an example in the rangefinder camera section in this web site. Nikon finally decided to give its cameras a variant of the Contax bayonet mount. Contax and Nikon lenses are interchangeable on both rangefinder cameras, but focusing will be different as the pitch of focusing wheels in the Contax and Nikon rangefinder cameras are not identical. This may result in a wrong - thus not sharp - image. Nikon lenses, produced for Contax cameras, have a C engraved in the lens barrel; not to be confused with the C in the name ring of a lens. That letter stands for ´coating´. The focal length of most lenses is indicated in centimeters (cm) with a notation as in the English language: 2.5 in stead of 2,5. The distance is in feet. 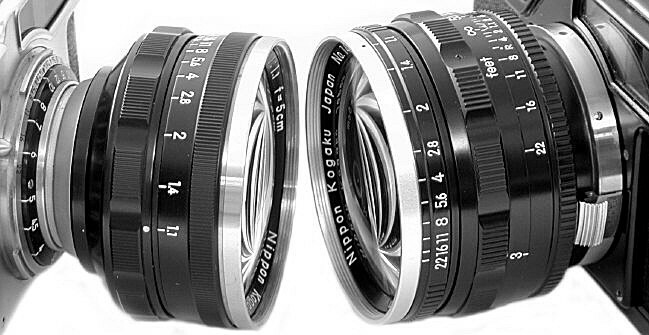 Nikkor lenses made with a Leica Thread Mount (LTM) can be focused closer than those with the various bayonet mounts. The reason for this is the difference in the register (film plane to mount distance) of the Nikon rangefinder cameras (34.85 mm.) and that of the Leica screw mount cameras (28.8mm.). The LTM Nikkors are a bit (nearly 6 mm.) longer leaving more space for the focusing wheel - inside the film gate - to come towards the lens mount. All LTM Nikkors have a separate distance scale of that extra close focus range. 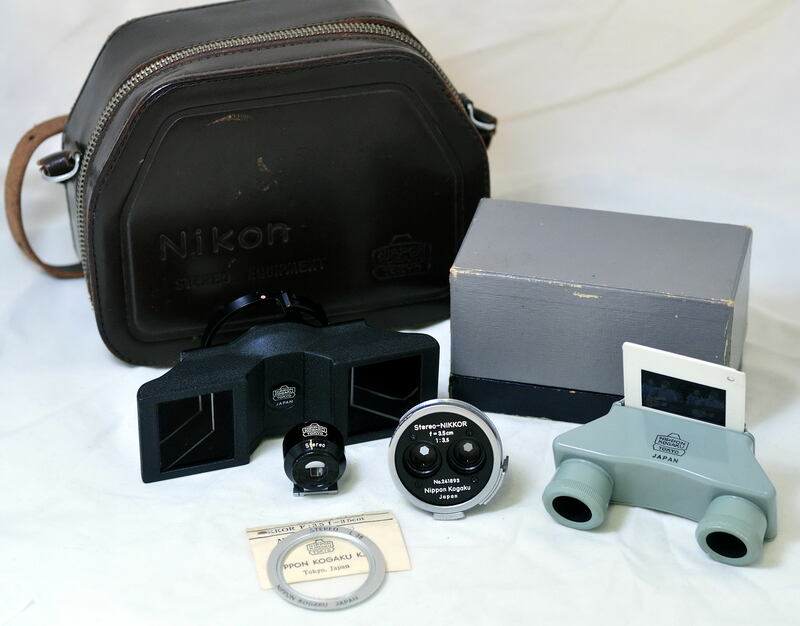 Special attention should be given to the interchangeable lenses for the Nikonos rangefinder cameras. These lenses are of a total different nature and are described in the Nikonos underwater camera section in this web site. T (Tres) = 3 elements - Q (Quattuor) = 4 elements - P (Penta) = 5 elements - H (Hex) = 6 elements - S (Septem) = 7 elements - O (Octo) = 8 elements - N (Novem) = 9 elements. Some lenses, like the Nikkor-N 1.1/5 cm. (see below), do exist with an internal and an external bayonet. 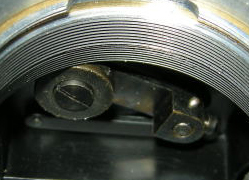 The standard lenses and the Stereo-Nikkor exist in an internal bayonet only. Note: For the Nikon N-F and L-F lens adapter scroll down, please. Nikon Corporation produced a wide range of lenses and accessories for its rangefinder cameras. An overview of all lenses can be found in the matrix. Some lenses and accessories will be reviewed hereafter as those items are very interesting and/or rare. Without straining the truth Nikon became famous - at the beginning - for its superb optical instruments, including photographic lenses. The very first Nikon rangefinder cameras weren't as solid and reliable as some competitors (e.g. Leica). A nice set for available light photography: Nikon SP & Nikkor-N 1.1/5 cm. & W-Nikkor-C 1.8/3.5 cm. & Nikkor-S.C 1.5/8.5 cm. Above a picture with three famous lenses. The extremely fast Nikkor-N 1.1/5 cm. which came in internal and external mount (see below). This huge piece of glass has 9 elements in 6 groups and can be focused down to 90 cm. It weights in at 400 gram and take 62 mm. filters. Its hood is even more interesting and very rare. Only 3,000 lenses were made. Its performance isn't bad at all. The corners are a bit soft full open, but contrast and sharpness improve after a few stops. Closing the lens at f/5.6 or smaller doesn't improve images; they become worse! The relatively fast wide-angle lens (Nikkor 1.8/3.5 cm.) is a very nice performer, especially for reporters. It has 7 elements in 5 groups, takes 43 mm. filters and weights in at 160 gram. Only a few thousand of the fast and excellent portrait lens - Nikkor 1.5/8.5 cm. - were produced. This lens has 7 elements in 3 groups and weighs in at 550 gram. The three lenses shown above are the best versions of its series. The Nikkor-H.C 2/5 cm. is an excellent and not too expensive standard lens. The all-black version is hard to find nowadays. The Nikkor-S 1.4/5 cm. is just one stop faster and as good as its less faster brother. The all-black version of the Nikkor-Q 3.5/13.5 cm. is a famous portrait lens. 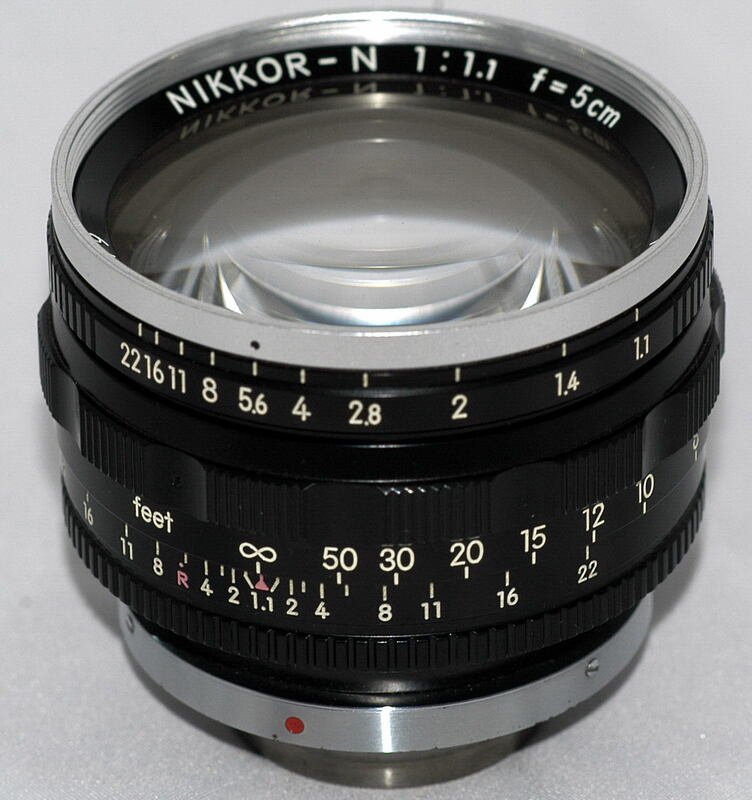 Another famous lens - among collectors - is this very rare and strange lens: the Nikkor-T 4/10.5 cm. This lens was introduced in Summer 1959. Many other lenses, like the 2.5/10.5 cm., were already selling by the thousands, but Nikon came with this one! Why? It could also be ordered with a Nikon F-mount. Experts believe that less than 1,500 lenses were produced. To use a lens with a focal length longer than 13.5 cm. one has to make use of the reflex housing. Below you'll see a Nikon S2 with a Type I Reflex Housing & a Nikkor-Q 4/25 cm. and the necessary cables. 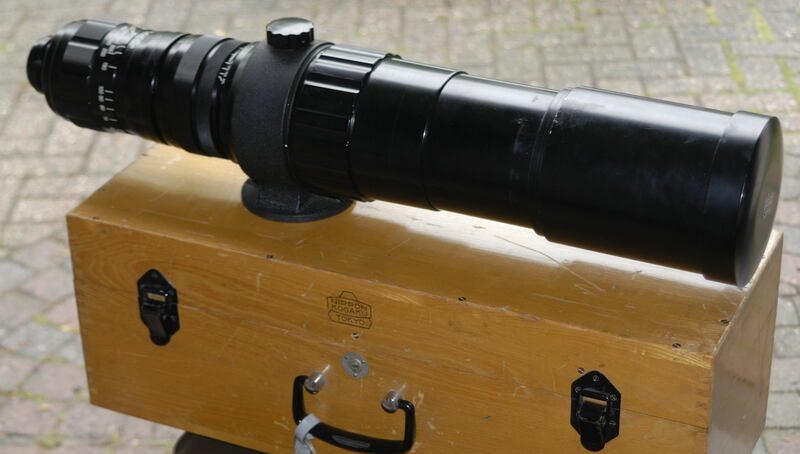 The focusing eyepiece and the focusing screen underneath can be removed and exchanged. The second version of the reflex housing (see below) has a different finish and a 45 degree finder. The Nikkor 4/25 cm. telelens has 4 elements in 3 groups, focuses down to 3 meter and takes Series IX (68 mm.) filters. Approx. 600 lenses were made. A Reflex Housing has also to be used for macro-photography. Nikon provided macro-lenses for the standard Nikkor 2/5 cm. and Nikkor 1.4/5 cm. but other lenses attached to e.g. a bellows a reflex housing is necessary. Above a Nikon S3 with Reflex Housing Type II with the very first bellows and a standard Nikkor-S 1.4/5 cm. in reverse position. Above the heaviest (8.5 kilo) Nikkor for rangefinder cameras: the rather rare 5/50 cm. telelens on top of its wooden trunk. This lens can be used in combination with a reflex housing only. Another rare lens, made for the rangefinder cameras, but also usable on the single lens reflex cameras, is the very fast Reflex-Nikkor 6.3/100 cm. 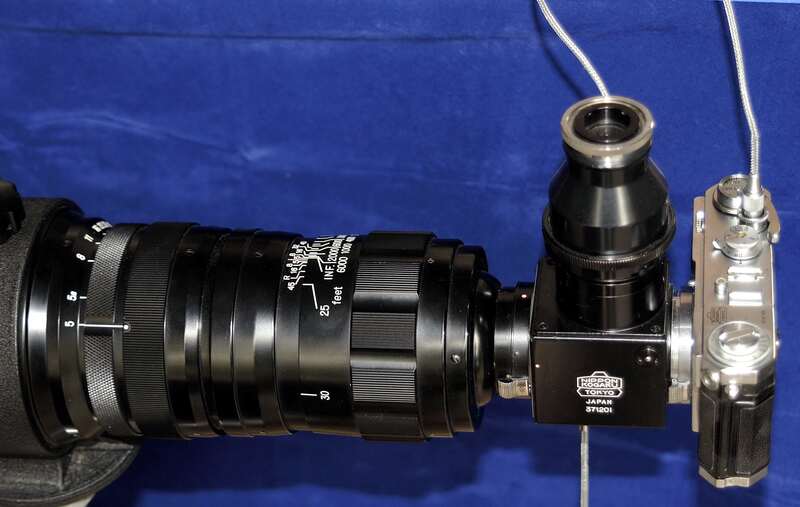 This catadioptric lens - aka mirror-lens - was one of the fastest ever produced. Only Carl Zeiss had a 5.6/1000 mm. Mirotar to offer. It is an extremely rare lens, as factory records say that only 48 lenses were made! More details on reflex-lenses can be found in the relevant chapter. Reflex-Mirror on a Reflex Housing Type II. Another exceptional and very rare lens is the Stereo-Nikkor with two 3.5/35 mm. in one lens body! Only some 150 lenses were made, thus making them rare and expensive. The lens came with a special hood and finder in a leather case. Nikon made a lot of accessories for their rangefinder cameras, like flashes, motor drives, viewfinders and eyepiece correction lenses. Not all are reviewed in this website. For viewfinders have a look here. Nikon introduced two so called N-F adapters to mount the RF-lenses of 180, 250, 350 and 500 mm focal length on Nikon F-mount SLR cameras. The first adapter (above left) has a non-rotating mount, the second model (above right) has a rotating mount. 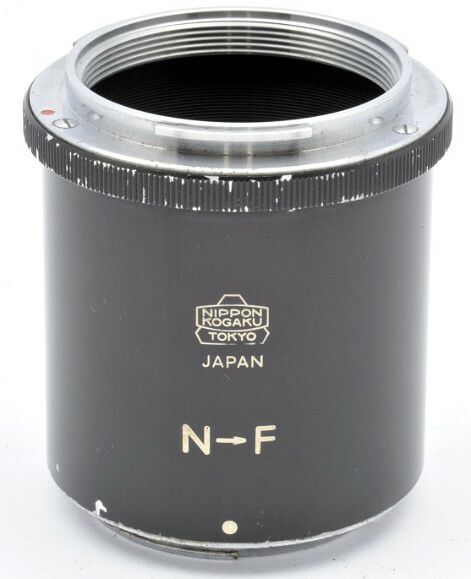 The L-F adapter will mount Nikkor rangefinder lenses with a Leica Thread Mount (LTM) on any Nikon F-mount SLR camera. Four models of the N-F adapters are known.